SWBAT calculate k, the constant of proportionality given a table of values. An art teacher mixes 20 ounces of yellow paint with 8 ounces of red paint. How many ounces of yellow paint would she need to mix with 18 ounces of red paint to maintain the same proportion? At the end of the question we see the word proportion, telling us exactly how to complete this problem and find the answer. This was best example I could find within three years of pre-CCSS tests which I can compare the first question in the Do Now in concept and rigor. Looking back at the old tests is a great way to understand how much the cognitive demands have changed for students’ problem solving skills. The current mathematical practices, specifically MP1 in this example, can be used to help students in this shift. I also like to be transparent with my students about the shifts. We often have open conversations about “why the math has gotten to hard”. It is so important for them to know that there is nothing wrong with their abilities, they are simply being asked to think more for themselves and persevere to make sense of problems, rather than simply calculating answers through steps given within the problem. The remaining problems review student knowledge of solving multi step equations and inequalities with fractions. I will focus on solving by clearing the fractions with the LCD. Once we are done reviewing the answers and students have had an opportunity to ask questions, I distribute the class notes and we transition to the next part of class. Red font included in the notes is meant for students to copy off the chalk board or SMARTBoard, depending on where I’m showing the notes today. We begin by reviewing the definition of the constant of proportionality as, “The constant value of the ratio of two proportional quantities x and y”. Understandably, this is complicated definition that will require several students read it out loud and students reading it to each other. What is the ratio given in the example? What are the quantities given in the example? What does the word constant mean? What is the constant value in this example? What is another name for this constant value? How can we use this value to determine the cost of 4 notebooks? Where would I substitute 4, the number of notebooks I am purchasing? Which letter, x or y, represents the number of notebooks? Which represents the number of notebooks? If students cannot identify the correct places to substitute these values, I do not give them the answer, or rush through that piece. Instead, I move on and explain dependent and independent variables. It is important to get students to make these connections on their own rather than feeding them the information. Common core demands these connections be made by students so that they stick. After writing down that the constant of proportionality is written as a ratio of the dependent over the independent variable (y/x), students must tell me how to complete the equation about notebooks. There is extra space provided in the notes to do this. Two additional examples are given to students to practice this new concept and for me to work with small groups struggling to understand. The last 6 – 7 minutes of this section of class should be saved for this activity. I ask students to meet me in a corner of a room if they still do not understand and we review using whiteboards. A timer is set at the board to keep us all on track. At the end of this time, we will all need to be back in our seats, ready for the Task. Three booths will be set up with pieces of chart paper and boxes of markers. Students are handed the Task assignment which includes 7 problems. In order to earn booth seats, students must correctly answer the first three questions. I will be sitting at a table near our booth seats where students must come see me to check their answers and give them quick feedback. My feedback will direct them back to their notes. The most common error I expect to see for these first three questions is student miscalculating the constant of proportionality as x/y because of the way the tables are organized on their papers. What is the question? What are you being asked to find? First we need to find k, the constant of proportionality. How do we find it? Students may also be confused with questions where the dependent and independent variables are not easily identifiable, such as problem #4. 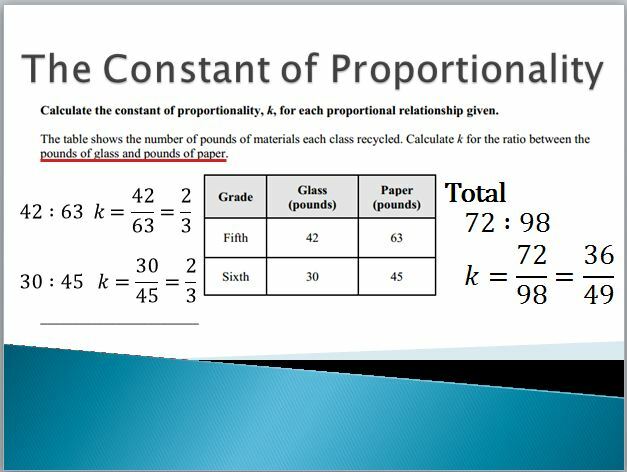 In this example, students in the 5th and 6th grade are collecting glass and paper to recycle and the questions asks to calculate k “for the ratio between the pounds of glass and pounds of paper”. For these examples, I will ask students to create ratios in the given order within the problem. For this particular example, students may calculate the ratios per class or calculate the ratio as a total for both classes. We find that for both classes the ratio is equivalent, but it changes once we combine the values. These are important findings that students should be pushed to identify on their own and include in their chart paper. Even if two students complete the same problem on chart paper, they may present different, unique findings in the closing section of this class. In the last 10 minutes of class I am asking students to come to the front of the room with their chart paper to explain how they solved one of the last 4 problems. I make sure to select and celebrate students who are showing work neatly and push students to communicate about the concepts (rates, ratios, constant of proportionality, dependent, and independent variable) through guiding questions like those included in the Task section or by encouraging other students to ask questions if they are struggling to understand. Homework is distributed at the end and students are dismissed.